Twelve years into our marriage, I found out that Clint had an affair. A few days after his initial confession I found out there was more. He’d had multiple affairs over the course of almost four years. It was completely devastating and life-altering. In all of the ways you could possibly imagine. It was also completely life-altering in a plethora of good ways as well. It completely rocked our marriage as we knew it. It turned everything upside down. It required us to take a long hard look at the state of our union and be honest about what we wanted our marriage to actually look like. During the aftermath of Clint’s affairs, digging through all of the rubble, we both realized that we had changes we needed to make. There were a number of cultural lies that we had bought into that contributed to our marriage being ripe for an affair. Because of that, one of the most important aspects of our ministry at Marriage Life is sharing truths with others that will hopefully rock their marriages and their mindsets for the better. We have realized the importance of living in truth and not buying into the lies that we are fed through TV, music, and our own basic thought processes and then choosing to daily live out that truth in our actual lives and marriages. *Unrealistic expectations will kill your marriage. Unspoken expectations will kill it just as fast. Your marriage will never look like your parents so quit silently expecting your husband to be just like your father. Your marriage will never be like your favorite Hollywood love story. They aren’t real. Quit expecting your spouse to talk to you sweet every moment of every day, to be perfectly romantic at all the right times, and to say all the right things just when you need them. We set ourselves and our marriages up for failure when we go into them with unspoken, unrealistic expectations for our spouses that they can never measure up to. It is more than okay to have expectations but we can’t create ones that your spouse can’t or won’t live up to. My husband is not a huge romantic by nature. I love all of those little gestures like hand holding, coming home with a single rose, little back massages. When we were dating he actually told me he didn’t like giving massages. Yet, what did I do? Continued to harbor that expectation that in my marriage I would have a husband who would give me massages whenever I wanted. Years later, he knows how much I enjoy them and we meet in the middle. It’s not something I expect and its something that’s even more treasured when its given. *Your spouse will fail you. Plan on it. A while ago, we read about marriage speakers who will have their audience turn to their partners and actually have them say this to each other. “You will fail me.” Your spouse might not fail you in the ways that my husband did me, but they will still fail and fall short. It’s inevitable. If we stop elevating our spouse’s to God-like status and remember that they are fallible human beings we are more apt to accept and respond to failures and disappointments with more grace. If we are in relationship with people who are going to fail us and not meet our expectations we are going to have to learn to be forgivers. One of the first things I did when Clint confessed was forgive him. I just heard God speak to my heart and I knew. Didn’t I keep making the same mistakes over and over? Did I desire forgiveness every time I failed? Lack of forgiveness to me felt like I was telling not only my husband but also God that what Clint had done was just too big. Too big to forgive. Too big for God to heal. And that’s not true. Nothing is too big, or too bad, or too awful for God to completely restore and make new. If your marriage is struggling or experiencing infidelity we at Marriage Life want you to know that we are here for you and we are in constant prayer for you. Do not hesitate to reach out and daily keep doing all you can to make your marriage all it can be! Thank you for this word. I too decided to stay and after 8 yrs. I still struggle with some bitterness that wants to pop it’s ugly head up every once in a while but I’m so glad I trusted the Lord to heal this marriage. I know he will! God is good and he does restore the broken. I found out on Valentines day that my husband of 18 years was in a relationship with an employee for at least the past year or more. I had known something was going on and yet could not find solid evidence, so I prayed God would reveal it to me and He did. I never dreamed he could do this act of betrayal and adultery. Yet, it happened. My whole spirit was in such shock that all I could do was breathe. I leaned on God through the most difficult time in my life and He was/is so wonderful. He gave me everything He knew that I needed. He spoke to my heart to forgive my husband like He forgives me. This was a process as my best intentions was to forgive and yet I found myself having to forgive him everyday. He would place Bible verses in my path and songs at the right time to encourage me. One verse that really stuck out was about one who shows mercy will be given mercy. I was reminded to place God above all my human nature and focus more on pleasing Him and looking towards eternity. Satan loves to attack Christians and the Bible tells us to expect these things. We need to be ready and decide how we will deal responsibly and God pleasing with the hurt. It has been about 8 months since the affair ended and we are redeveloping our friendship and marriage. This has been a struggle at times, but we keep getting back on the wagon so to speak. I look forward to the days ahead and I pray that God would bring my husband back to Him with a desire to please Him with all that he is. Stay in the Word and close to The Lord always. He is our joy, strength, rock, redeemer and wonderful counselor. Amen! Continue to lean on God and trust in Him! Forgiveness can be a difficult process but it is a necessary one and it is one that reaps huge benefits. Oh boy, this was like reading my own story. It started out as innocent emails with these women. He is a firefighter and so is a rescuer…after the 3rd one, we stepped back and took stock of our marriage, where we wanted to go and how to get there. I had to say some very hard things to him and to his last “fling” and because I am not confrontational this was quite a growth experience. I also had to hear some hard things-also a growth experience. The road has been hard but well worth it. Still have some things we are getting through but I love him more than ever and am so glad God led us to stick it out. God is good….and growing us each and every day!! Jessica – you make a great point when you say “we still argue.” I could have easily added that into the list of “truths” that I felt led to share in this post. 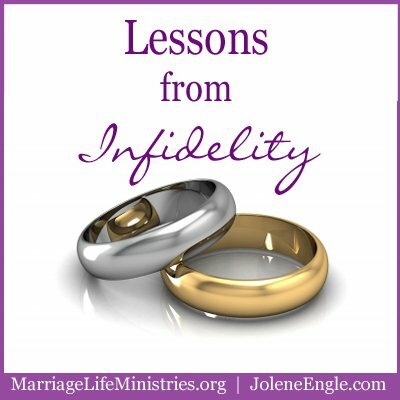 Marriages that God restores from infidelity aren’t magical and perfect. We’re still two imperfect human beings attempting to do life together every day. That will inevitably create all things human – insecurities, hurts, disappointments, anger. But… I think the thing that I can appreciate about having been where we’ve been is that when he do have those hurts or disagreements now we work that much harder at putting things back together because we never want to see our marriage get to place where infidelity is a possibility again. I was not so fortunate. My ex-husband had many affairs. He was also verbally & emotionally abusive. I stayed too, but ultimately he left me right after I had foot surgery. He left me when I was unable to walk and adequately care for my children. Shortly after leaving, he moved in with his latest fling, who was also married at the time. I wish things could have been different. I wish that he could see the damage his actions have inflicted. I can only assume He has something else in mind for me; and that He was protecting me and my children from further abuse. But I still pray for him, I pray especially for his spiritual healing and ultimate conversion (he claims to be Christian, but his actions obviously show otherwise; however, that is ultimately between him and God). I am so glad to see that God has restored these marriages. Praise God for His healing and for your acts of forgiveness. Heather – Thank you for your comment. I’ve always believed that restoration from infidelity happens in many forms. Even though some marriages do not heal from this crisis what is important is that your own heart heals and becomes restored. Yes. His was mostly e mails as well with some private meetings and seeing eachother at work. I knew that God would not allow this for nothing. God was using the difficult times for His glory and our good. I read the book Boundries and the book Boundries In Marriage. I highly recommend them. Highly. God has changed me in this painful process, but in order to get to the pure gold, one has to persevere through the intense fire to burn off the impurities. He is the Refiner, but He is also our strength and joy. Rejoice in your sufferings….He loves you too much to allow you to carry those impurities. He says, “be holy as I am holy.” He wants to present you to Himself as a radiant church. Amen! I too read those books and they were so helpful and eye-opening.